Don’t let my previous post fool you into thinking that the Highlands are all about quiet meditation and communing with nature. No no, they’re also all about drinking Scotch and stuffing your face with a variety of fried animal products. Naturally our evenings were surrendered to the obligation to experience the country’s eponymous liquors. 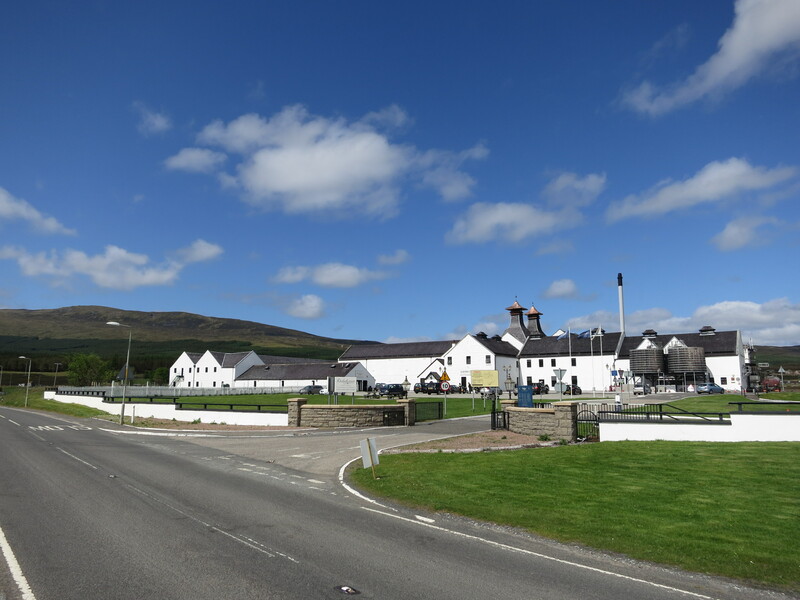 Some new discoveries – Highland Park, Tomatin and Tobermorey – were definitely appreciated. But none surpassed the old favourites: Lagavulin, Ardbeg, Caol Ila and Laphroaig. Aside from our enjoyment of the particular libations we sampled, though, there are two things about Scotch in Scotland that impressed me. First, the average bar has more Scotches behind it than most restaurants in the rest of the world have wines in the cellar – and your chances are pretty good that the bartender can wax lyrical about the majority of them. Second, when after a long afternoon walk we wandered to a corner store / newsagents to grab a nice refreshing beer to enjoy on the nearest patch of green grass out in the sunshine, we were confronted with a range of Scotches that any of the three of us would have been proud to host in our home collections (both for size and selection). Between our evening adventures in whatever hotel we happened to be staying in, and a couple of distillery visits (to Dalwhinnie and Blair Athol – both fairly uneventful, and we should have gone for Glenfiddich and Aberlour instead, in hindsight), I’m comfortably proud of our efforts in the Scotch-sampling department. And our efforts on the food front were equally exemplary, especially for breakfast. The Scottish breakfast is fantastic: every bit of the animal they didn’t serve for dinner last night, fried, plus an egg. I will admit to an embarrassing secret: despite multiple opportunities, not once did I order the kippers to break my fast. That said, the plate of various offals (plus the egg, of course) never got old over the six breakfasts I enjoyed, so my lack of adventurous spirit wasn’t the end of the world. And it’s not like there’s not variety built right into the Scottish breakfast itself. Between the bacon (pig), egg (chicken), sausage (pig again), haggis (sheep), and black pudding (completing the porcine trifecta), there’s a fair few meals’ worth of vegetarian-unfriendly stuff shoved into that one plateful. If only they could figure out a way to get some lamb and beef in there, they could collect the whole set. Perhaps some sort of fried variation on a kebab-like effort is required. Of course, with breakfasts like that, one hardly needs lunch. But driving (or in my case, sitting in the passenger seat occasionally fiddling with dials) is hungry work, and the Isle of Skye provided us an excellent bakery in a tiny little town we passed through (before quickly unpassing through to come back and investigate in more detail). Coffee, a toasted sandwich, and some incredibly dense chocolatey cake-like muffin things ensued. And a follow-up hot chocolate for good measure. Can’t do these things by halves. If I remember rightly, it was called Jan’s Bakery, and it might possibly have been in Dunvegan. Or it might possibly not. Wherever it is, I heartily recommend it! So at the end of all that, after our bike riding on our last morning in Boat of Garten, we stopped in a likely-looking Aviemore establishment to celebrate our good work and say goodbye the best way we knew: with frankly alarming quantities of fish and chips, and half a fried pizza. Delicious. This entry was posted in Food and drink, Travel and tagged scotland by Sam Roberton. Bookmark the permalink.